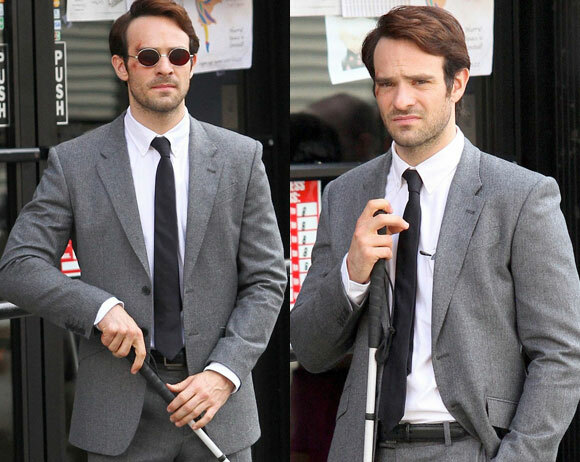 Charlie Cox has been at work on Netflix and Marvel’s “Daredevil” TV series and Just Jared has posted photos of the British actor in costume as blind lawyer Matt Murdock, the man who suits up as “Daredevil” to fight crime. Close up photos showcase an interesting scar that has been added to the character’s right eye. Speaking of the Man Without Fear, the previous Daredevil himself Ben Affleck is currently busy playing Bruce Wayne/Batman for Zack Snyder’s upcoming “Batman v Superman: Dawn of Justice”. Photos and a bit of video have been taken of Affleck on the set confirming that the older, hardened Wayne we see in the film looks like… well like Affleck, albeit with some silver flecks on the sides. The clips are up at JGE.TV.